COLORADO SPRINGS — U.S. Air Force Space Command is finalizing a plan to revamp ground control systems for military satellite constellations. Current systems suffer from problems such as user-unfriendly software, outdated cybersecurity standards and difficulties sharing information within the military’s space enterprise. The problems are well documented but the Air Force has struggled to come up with solutions. Air Force Space Command last year decided that the answer is a universal command-and-control architecture called Enterprise Ground Services (EGS). A memo signed in August by AFSC Commander Gen. John Raymond declares EGS the “common platform to execute satellite operations for tactical command and control of space assets.” To ensure information can be shared, EGS will require “machine to machine exchanges” in all ground systems. They also must use universal messaging standards, according to Raymond’s memo. The Air Force’s 2020 budget proposal adds a new funding line for EGS, requesting $138 million to develop and test software. Legacy ground systems will have to transition to the EGS architecture over the next decade. That includes the ground control for missile warning, satellite communications, space domain awareness and experimental satellites. “EGS prepares us for tomorrow’s fight by increasing enterprise resiliency and capability,” Col. Jesse Zydallis, Enterprise Ground Services chief at the Air Force Space and Missile Systems Center, said in a statement to SpaceNews. Zydallis said the goal is to have a “common ground platform for commanding and data sharing.” Commonality would save money on software upgrades and expedite the refresh of software applications. SMC is now developing the EGS Service Catalog to support government and industry software developers, said Zydallis. Vendors will be expected to follow the guidelines provided by the EGS Service Catalog as they become available, he said. The catalog offerings will grow over time. Zydallis’ office is working with each mission area across SMC to help develop individual transition plans for each ground system by November. What exactly EGS is and how it will affect current space programs are questions still not well understood, however. Contractors are waiting for details that will inform that what they should do now to prepare, industry sources told SpaceNews. The Air Force has a spotty record with software developments. Space ground systems are especially challenging due to security requirements and mission complexity, said Jon Ludwigson, acting director of contracting and national security acquisitions issues at the U.S. Government Accountability Office. GAO concluded that the poor performance of software programs is caused by the government’s failure to involve users early in the development. Program managers don’t get enough feedback from users until it’s too late or too expensive to change the design, Ludwigson said. The Air Force is now shifting to “agile development” of software to speed things up, “but they should involve the users a lot more,” he said. “That is one of our critical findings.” The Air Force has to put software in the hands of users as frequently as possible, he said. GAO’s findings echo what many vendors have heard from customers in the military space enterprise, said Michal Anne Rogondino, a former Apple designer and now CEO of Rocket Communications. The San Francisco company received an Air Force contract four years ago to develop a user experience software tool to help developers create apps for EGS-compliant ground control systems. The user experience is critical to the success of EGS, she said. 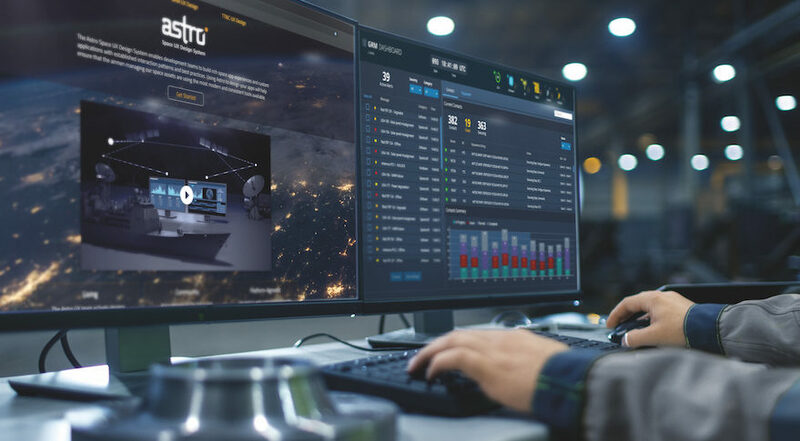 Rocket Communications set up a demonstration of its user experience tool, called Astro, at the Space Symposium. The product demonstration is aimed at military space operators and contractors looking to develop intuitive applications for DoD space systems.